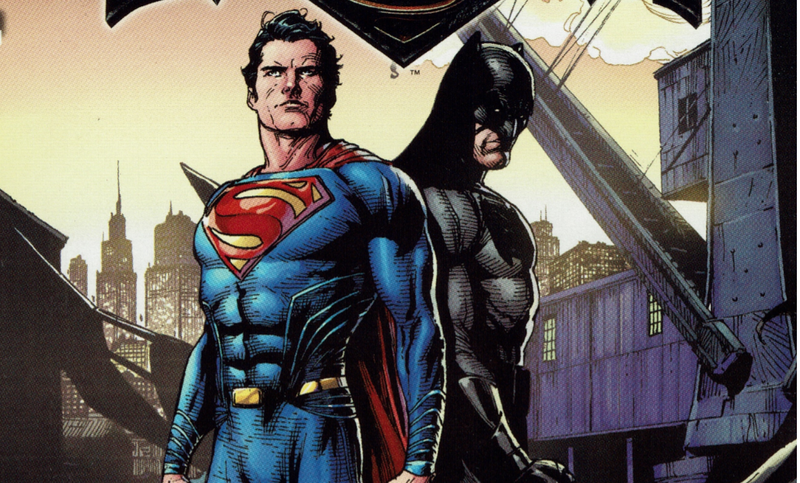 Right now there are 9 Batman v Superman prequel comics available (download links to them below) and they have given us a good idea of what the world is like after the events of Man of Steel, and how people view Superman and Batman. So if you can’t be bothered reading all the comics, I’ll give you a quick rundown of all of them. In this comic Clark Kent joins a school field trip (he currently works at the Daily Planet writing for the world beat and science news) to S.T.A.R Labs. S.T.A.R Labs is of course currently the setting over at The Flash TV show (which is a separate universe), but is also a place strongly connected to Cyborg in the comics. The comic follows a kid named Jacob who is part of the field trip. In the morning Jacob meets his new neighbour, Lucas, who finds himself getting picked on the first day of school. Jacob knows he should help, but he doesn’t, he’s in a rush. But luckily for him, Clark Kent breaks up the fight. During the field trip things don’t go so well (obviously), and basically an experiment goes wrong which leads to aliens showing up! Clark Kent suddenly goes missing and Superman arrives! Jacob is amazed as he watches Superman save everyone. But even more so, he’s amazed that even though Superman isn’t human, Superman considers himself to be part of humanity. Jacob notes how Superman doesn’t take on trouble because he knows how to solve everything, he does it because it’s the right thing to do. At the end of the comic we see Jacob stand up to Lucas’ bullies, after being inspired by Superman. And that’s what’s so great about this comic, it shows how everyday people are being inspired by the goodness of Superman. This comic follows Zoe, a kid on a field trip to Wayne Enterprises, who’s curious with what’s going on behind closed doors. It’s revealed that Wayne Enterprises has collected technology after Zod’s attack and is analysing them. She ends up accidentally spotting a group of criminals trying to steal some of the Kryptonian technology, but luckily Bruce Wayne is there to help her out! Bruce proves to be quite resourceful, swiftly knocking people out and using gadgets to help diffuse the situation, until Superman arrives on the scene. Superman stops the bad guys and collects some of the Kryptonian technology. Bruce and Superman never meet but we all know it won’t be long until they do meet for the first time. This comic follows Emily, a kid who ends up witnessing Batman in action. It’s revealed that most people don’t think Batman exists, he’s an urban legend, and none of Emily’s friends believe she saw him. So she tries to get some proof by staking out the streets so she can get a clear picture of him. Emily ends up getting the picture, but because her friends kept teasing her about her belief in Batman being real, she freaked out before she could show them the proof. Later that night, outside her bedroom window she spots a figure, it’s Batman! This Batman may be a little more angrier and tougher than what we’re used to seeing, but he’s not one to terrorise children. Instead Batman tells Emily that he’s impressed by her skills to get a picture of him. He believes that she’s part of the next generation who can make the city better and trusts that she’s intelligent enough to do the right thing. Emily realises that Batman is able to be effective because criminals fear what they don’t know, they fear the myth of Batman. So she tears up the image. This comic follows Robbie and Carter, two kids (in what seems to be an orphanage) fighting over who’s better, Batman or Superman. Carter thinks Batman is cooler. Batman is mysterious, selfless, helps the police, is humble and tough. Whereas Robbie thinks Superman is better because he uses his powers to help everyone, even when he doesn’t have to, can do things that are too hard for anyone else and can fly! They think there’s only one way to settle this argument, Batman and Superman must fight! Before their argument gets out of hand their very wise friend comes in and tells them that surely Batman and Superman would realise that instead of fighting, they should be friends and work together to save the day! And that obviously Wonder Woman would beat them both anyways! 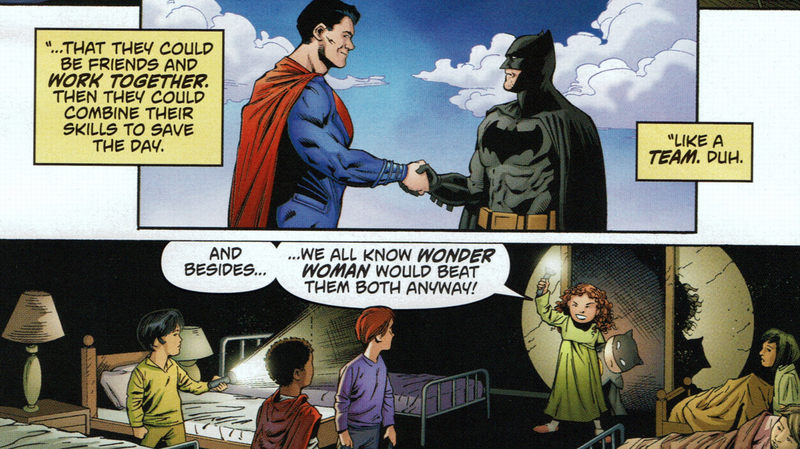 I liked that we saw the classic World’s Finest handshake in this comic, of course the handshake only happened in the kids’ mind, but hopefully we get the real deal at the end of Batman v Superman. Kids love Batman, Superman and Wonder Woman already! This comic follows Firefly and a bunch of thugs, who in the middle of their crime start talking about Batman. They talk about how before Batman was tough, but after what happened in Metropolis he’s even tougher than before. Batman thought he had everything figured out, that he could handle anything, then all of a sudden aliens come down and cause chaos, what does that do to a man like him? Batman eventually appears on the scene and brutally takes everyone down. We then see at the end of the comic that Lex Luthor is spying on Batman, perhaps realising that if someone could take Superman down, it would be Batman. This comic gave us insight into how criminals view Batman, it’s clear that he has a massive impact on them and that he’s changed a lot since Superman’s arrival. This comic follows Lois as she chases a story regarding Mr. Hanford, of Hanford Technologies, who she catches selling illegally stolen Kryptonian technology. Things start getting messy as Hanford feels threatened and takes a gun out, but Lois proves quite resourceful and finds a way out of the situation through her words (oh and she elbows him in the face). Eventually she’s able to get Hanford arrested and write the big story. Later we see that Lex Luthor being the kind one he is, buys Hanford Technologies to save the innocent people who work there from losing their jobs. Lex says quietly to himself that there are so many more interesting things you could do with Kryptonian technology instead of selling it, I don’t know maybe like making Doomsday! It’s clear that Lois is following up on everything that has been happening since the battle in Metropolis, including tracking down where all the remaining Kryptonian technology has gone. I liked that we got a Lois-centric comic, hopefully we’ll see a strong story arc from her in the movie as well! This comic follows Senator Finch and a group of government officials who are concerned about Superman’s arrival. Finch doesn’t hate Superman, she acknowledges all the good he has done, but realise that they need to take preventative actions to make sure they are always one step ahead of Superman, in case anything goes wrong. They’re concerned with how people are reacting to him, some even believe he is a scout for a future alien invasion. So they feel like they need to be prepared, even though so far he’s stayed out of politics. At the end the group agree to form a committee designed to study Superman and his effect on the world. This comic showcases Superman’s skill in expertly stopping a runaway train, highlighting all his calculated choices in preventing a crisis. The media discuss this, debating that even though what he did was good here, it doesn’t mean he’s always going to be like that. There’s a split in opinion regarding the choices Superman makes. Some like that he doesn’t involve himself in political conflict like war, however others think he should be doing more to help considering he has the power to save so many people. At the end of the comic we see Lex Luthor watching the media coverage, with Lex claiming that he’s counting on complicated problems to come to Superman (you know like Batman and Doomsday). This comic follows Lex Luthor’s public image, as he is recognised as a hero for helping to rebuild Metropolis after the Black Zero event. In public he’s acting like a champion to the ordinary people, a saviour to Metropolis. However when a journalist compares him to Superman, he quickly changes his tune. He claims he can’t make a judgement about Superman because he doesn’t know enough about him yet. At the end of the comic we see that Lex Luthor has been studying Superman and Kryptonian DNA. We see images of Zod’s body and DNA strands, which we know will eventually lead to Doomsday. This comic was interesting because we started to see the split between Lex’s public persona, and his private one. So don’t think that the quirky Lex we saw in the trailers will be how he always is in the movie, we’re going to see a much darker side. Lex Luthor is spying on everyone! I recommend you checking out all the Batman v Superman prequel comics yourself, something to keep you busy before the movie comes out. It’s clear that Superman and Batman have a big impact on the world around them, so it’ll definitely be interesting to see how the world reacts after the events of Batman v Superman, when presumably, the Justice League starts coming together.